She Should Run partnered with Decision Analyst to conduct a national, online survey of 500 parents/guardians of girls who are aged 5-10. New research underscores the uneven playing field for boys and girls when it comes to leadership. Parents see their daughters as natural-born leaders and a majority of these same parents believe that girls will have to work harder to enjoy the same success as boys. Moms and dads acknowledge that a gender gap in leadership and politics exists but they don’t necessarily view boys as more qualified leaders. In fact, most parents perceive both boys and girls to be equally likely to do a good job in a leadership role. It's more important than ever that we support and encourage young girls ambitions to lead. It's on us to tell girls that they can do anything, that they can lead, and that their voices will make a difference to their community, their country, and to the world. The new research underscores the uneven playing field for boys and girls when it comes to leadership. 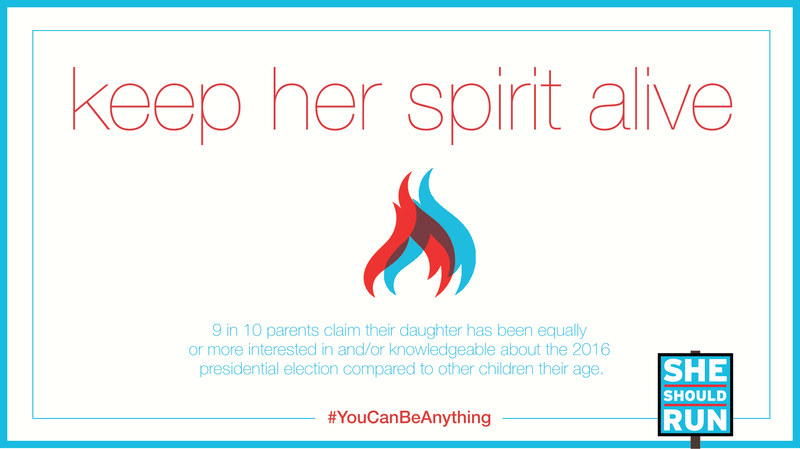 Parents see their daughters as natural-born leaders, setting lofty goals and believing in their ability to succeed. Yet, these same parents acknowledge that a gender gap exists in the fields of leadership and politics. Moms and Dads agree that boys are more likely than girls to enter the world of politics/leadership; to receive encouragement to do so; and to be taken seriously in this space. And the majority of parents believe girls will have to work harder to enjoy the same success as boys. But they don’t necessarily view boys as more qualified leaders. In fact, most parents perceive both boys and girls to be equally likely to do a good job in a leadership role. Girls are perceived to be more in tune with others while boys are perceived to be more outspoken. Lack of confidence – in terms of fear of failure and fear of speaking in front of others – is what parents say would present the biggest barrier to their daughters pursuing a leadership role. Parents, especially moms, are interested in more leadership programs for girls – including after-school programs, mentoring programs, and a leadership course in school – as well as specific resources for parents – to help guide their daughters into leadership. Based on these findings, we have launched an incubator course for parents to use with their daughters to inspire the next generation of leaders. If you’re a parent or family member or mentor - and you want to help a young girl in your life see her own possibility and promise, this course is for you. It’s designed to give you tools and activities to talk to a girl in your life about the ways she can become a leader - and the obstacles she’ll probably face. Sign up for the She Should Run Incubator to access to the parents course.